This production rose to that upper echelon of our Shakespeareances in a matter of just two seconds of action near the play’s end with the death of Somerset. Whose death? Has a killing on stage ever been more thrilling? This production (part of ASC’s Actors’ Renaissance Season wherein the players use only prompt copy, have only days to mount the play, and do so without a director) would have been emblazoned on our memories simply for the fine performances turned in by the whole cast in an energetic staging. This troupe deftly handled this play’s line-to-line shifts from tragedy to comedy to violence. The actors presented the play’s absurdities as real drama, whether it was nobles wrangling like children; or ignorant, rioting masses deluded into seeing themselves as vanguards to social conscience; or a queen making out with the severed head of her slain lover in the presence of her husband and the whole of the court (Shakespeare’s most absurd scene outside of Titus Andronicus). But this production rose to that upper echelon of our Shakespeareances in a matter of just two seconds of action near the play’s end with the death of Somerset. Whose death? How could a secondary character killed in the play’s last battle be so indelible? For two reasons: method and substance. 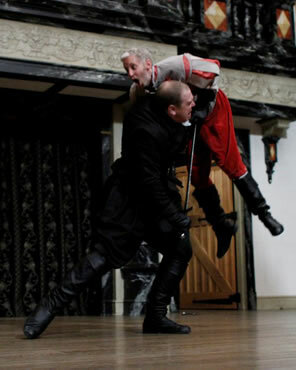 The method was beefy Benjamin Curns’ young Richard, Duke of Gloucester, impaling featherweight Bob Jones’ Somerset with his sword, lifting him high into the air and twirling him to the stage. The gasp from the audience was joined by the squeals of appreciative delight from members of the ASC touring troupe watching in the balcony. The substance was what this quickly passing moment forebode in this Shakespearean tetralogy, as this the future Richard III wrought such sudden, dynamic violence and altered the perception of reality in an instant. This fact was driven home at the play’s conclusion: when York’s party roared off the stage in pursuit of Henry’s faction, Curns lingered and glanced at the audience with a knowing grin before following his father out the door. Instant standing ovation ensued, a burst of glee in the moment as well as a tribute to the whole of the play. The cast was called out for four curtain calls. Above, Sarah Fallon as Queen Margaret, right, urges Denice Burbach as Henry VI to flee. Top, Benjamin Curns' Richard kills Bob Jones' Somerset. These climactic scenes of Henry VI, Part Two played out at the Blackfriars Playhouse. Photos by Tommy Thompson, American Shakespeare Center. Absolutely, we want more. More Curns as Richard. More Sarah Fallon as Margaret, all-powerful passion where she loved and mighty manipulation where she hated. More Denise Burbach as Henry VI, struggling to be good with a too-weak constitution. More René Thornton Jr. as Richard, Duke of York, a commanding presence who by sheer force of will convinces people he is rightful king (despite the obvious flaw in his argument). Can’t wait to see Rutland’s death played between Fallon and Thornton in Part 3. Can’t wait to see more of the dysfunctional interactions of Fallon and Burbach as warring queen and weakening king in Part 3. Other performances won’t continue into the threequel, but they left lasting impressions, too. Allison Glenzer played Eleanor, Duchess of Gloucester, as a woman frustrated by being in second place, overreaching in her pride and then completely devastated by her fall; her penance scene was heart-wrenching. Daniel Kennedy was a punk Cade in Cockney accent and high-waisted tight jeans and T-shirt, equal parts menacing hothead and comic philosopher. Gregory Jon Phelps continued his memorable Part 1 role as Duke of Suffolk with another memorable turn, not only displaying an egomaniac whose own haughtiness leads to his death, but tearful passion in his parting with Margaret. Special kudos, too, to John Harrell in the part of Bishop Beaufort; he gave the pre-show speech as a catechism in one of the funniest stand-up routines we’ve seen anywhere, and his Beaufort died with a frozen joker’s face, an expression he held for several minutes while his death scene played out. The production opened with two shrouded monks appearing on stage to an ominous drum beat, carrying a large scroll; this was unfurled up to the balcony to reveal a “Rose Wars” explanatory introduction as the ominous drum gave way to the Star Wars’ theme. One would have expected this to herald a slapstick staging to follow; but that didn’t happen. There was high comedy, low comedy, true tragedy and bombastic speechmaking. All the while the arc of energy remained steady (no easy feat in scene after scene focusing wholly on wrangling factions of nobility) until the second half when it rose steadily from Suffolk’s death through Cade’s rebellion to the battle of St. Albans culminating in Somerset’s high demise. No wonder the audience demanded four curtain calls: the play ended too soon.